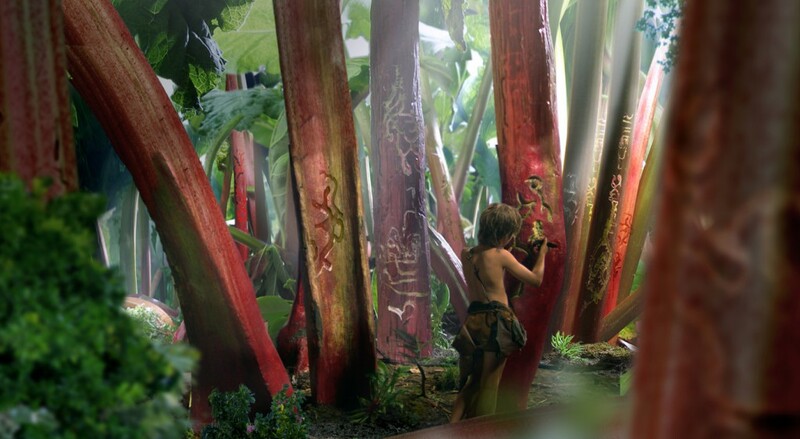 The film installation Rhabarber Boy (rhubarb boy) is setting a fantasy-world in relation to the archaic nature of a child, and raises the question about the moral responsibility of virtual creatures and content. The film describes the life of a wild boy, living in a forest without the influences of civilization. He is keeping an old comic-collage in his cottage and is trying to understand the colorful and figurative images of this icon. In Rhabarber Boy, there is a certain point of pending suspension, where the competing forces encounter each other mutedly and rush to the showdown. Down in the pit is the strange trio comprising a she-superhero, a shaman and a blue bear ‚“ up in the sky, the circling flying dinosaurs’ silhouettes with their raspy cries like hungry rooks and, in the middle, the boy who is impelled to exit this game which no longer is one. When he finally acts, the film’s ultimate setting appears to resemble the situation of the opening, though it has fundamentally evolved in the meantime. The golden cigarette starts to glow; it is like a key to enter the next level of the game. Reading Rhabarber Boy as an allegory, it is all about the self-assertion of the main character because the she-superhero, shaman, blue bear and even the dinosaurs and the jungle are all part of child’s naÃ¯ve imagination, as by the same token they show features of the standardised entertainment industry. There is no innocence on either side. The rules of the game remain unclear, however, and might even be set by the toys themselves. The beauty of Rhabarber Boy lies in the clear images that illustrate this evolution, which does not need any words, like a storybook into which one enters, represented by the collage that the boy studies for hours on end and the enigma of which could be deciphered provided one had the key, the missing word. Rhabarber Boy by ULU BRAUN is a parable of remarkable direct character, which appears to us at the same time both familiar and alien: familiar amidst the stock of saurian and supermarket; alien as mythical tale. Like other works by ULU BRAUN, Rhabarber Boy is a collage, combining video recordings with computer graphics and painting. In his work, the collage represents the possibility of immediate relation with these ad hoc visual materials, without the need to justify any departure from realism. Equally, Rhabarber Boy could be seen as an attempt to reproduce the overwhelming style of cinema blockbusters while competing with his own modest means and provoking a comparison. One of ULU BRAUN’S strengths is the non-ironical use of material, theme, problem, of the beautiful, the ill-favoured ‚“ a use that transforms from an open collage either to become a tale as in Rhabarber Boy or to develop into simultaneous occurrences as in the video installation Südwest. By means of the initial sequence of the film, the stream of the story is outlined ‚“ the blown-up to jungle-size rhubarb bed, the dragon flies and the silhouettes of the flying dinosaurs, amidst them the boy dissecting the game. The contemplator realises the paradigm of the situation: it is not that the boy only hunts for himself, but also does so in order to appease the greedy dinosaurs. Later, as additional elements of the story, the golden cigarette, the water bottle and the comic collage appear ‚“ from the latter emerge, in the second part of the film, the she-superhero, the shaman and the blue bear, which literally tumble into the world of the boy. The plot develops from the individual characters’ force fields instead of building on psychological motives. The film unfolds entirely without words or explanations. At the same time, Rhabarber Boy is a reflection on children’s naÃ¯ve imagination. 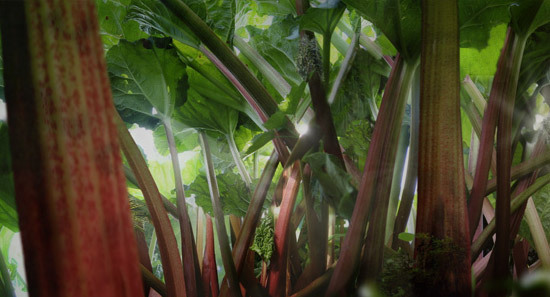 The world of games is expanded to a mythical scale as is the rhubarb bed to a jungle. The ripped comic collage constitutes their map. The boy looks at it with feelings of both fascination and amazement. On this map the prospective mingles with the departed. One night, the boy is roused out of his sleep. From far away, voices call him to a trap. In the pit he finds the strange trio, each of them being initially fully self-absorbed. However, shortly afterwards, first interactions take place. The she-superhero offers her breast to feed the little bear. The boy appears to be an undetectable spectator. He attempts to establish communication and to influence events. First, he throws a plastic water bottle with a red bow into the pit. The trio duly ignores this manifest offer which leads to the boy feeling unsettled. Down in the pit, conflicts emerge, the she-superhero stumbles across the bottle and gets injured, the water leaks. The events appear more and more threatening when dragonflies are hunted, the little blue bear reaches puberty and starts licking the she-superhero. The shaman mutates into a howling wolf. The comic characters are simultaneously antagonists and fruit of the childish imagination. The trap that was prepared by the boy, and into which falls the strange trio, becomes an arena of their abilities and a mirror of his wishes. The more he attempts to manipulate the events in the pit, the stranger and more hostile the behaviour of the toys becomes. Ultimately, he is left with the sole possibility of exiting the game ‚“ he lures the dinosaurs to the pit. The main theme of the film could be that the childish structure of the universe, in which there is no distinction between the past (jungle), the present (game) and the future (comic collage, plastic bottle), moves the child close to the mythical and enables him to enter the plot directly and to personify the character of the hero. In Rhabarber Boy the boy is not a tragic character, he is rather a personality who, by losing his toys, begins to understand the rules and the limits of his own potential (the game), thus anticipating grown-up responsibility.